Mark 16:9-20 Should these verses be in the Bible? The verses in question have been in every Bible we know about in history in every language it was ever printed in, except the liberal RSV that removed them, and then the NRSV put them back in again. Even critical text versions like the ESV, NIV, NASB and the modern Catholic versions keep these verses in their "bible" versions, although sometimes in brackets or in smaller italicized letters. If they really believe they are NOT inspired Scripture, then let them take a solid stand on their mistaken convictions, and simply OMIT them. But don't keep sitting on the fence and sowing doubt as to the true words of God. Oh...wait....THAT'S what they DO anyway, isn't it! As To MANUSCRIPTS, there are none older than the fourth century, and the oldest two uncial MSS. Vaticanus and Sinaiticus are without those twelve verses. Of all the others (consisting of some eighteen uncials and some six hundred cursive MSS. which contain the Gospel of Mark) contain these twelve verses. 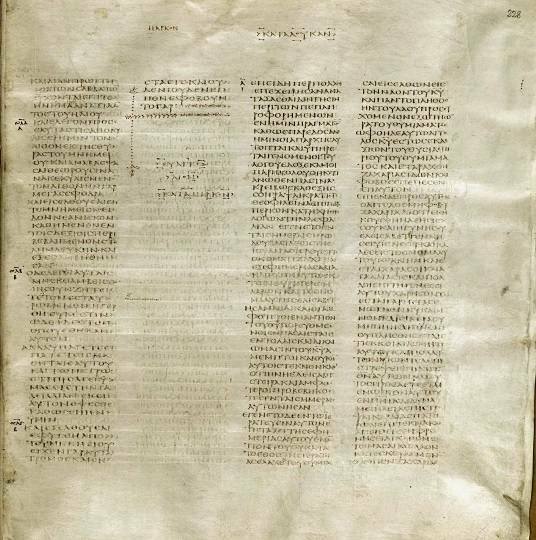 There are also some very curious irregularities with both Vaticanus and Sinaiticus. As Dean Burgon testifies, the Vatican manuscript has only one blank space in the entire manuscript and it is here at the ending of Mark 16:8. He says "it is amply sufficient to contain the verses, the column in question being the only vacant one in the whole manuscript." The Traditional Text of the Holy Gospels, Volume 1, page 298. As for Sinaticus, according to Dean Burgon pages 298-299, even Tischendorf (who discovered this codex) believed this whole section was originally canceled out and written over by a different scribe than the one who wrote most of the manuscript. Suddenly the letters in the columns become much larger than at any other place in the codex, either before or after. Dean Burgon points out that if the letters had been written in the normal size, there would be ample room for these missing 12 verses. See - The Traditional Text of the Holy Gospels, pages 298-299 The Last Twelve Verses of Mark. Even the UBS, Nestle-Aland critical textual apparatus show the overwhelming textual evidence that exists for the inclusion of these 12 verses. They are contained in the Majority of all remaining Greek manuscripts, including A, C, D, K, and other uncial (capital lettered) copies. They are found in the Old Latin aur, c, d, ff2, l, n, o, q, the Vulgate, the Syriac Curetonian, Peshitta, Palestinian and Harclean ancient versions, as well as the Coptic Sahidic, Boharic, the Gothic, the Armenian, the Ethiopic and the Georgian ancient versions and the early Greek Diatessaron. THE SYRIAC. The oldest is the Syriac in its various forms : the "Peshitto" (cent. 2), and the "Curetonian Syriac" (cent. 3). Both are older than any Greek MS. in existence, and both contain these twelve verses. So with the "Philoxenian" (cent. 5) and the "Jerusalem" (cent. 5). THE LATIN VERSIONS. JEROME (A.D. 382), who had access to Greek MSS. older than any now extant, includes these twelve verses; but this Version (known as the Vulgate) was only a revision of the VETUS ITALA, which is believed to belong to cent. 2, and contains these verses. THE GOTHIC VERSION (A.D. 350) contains them. THE EGYPTIAN VERSIONS: the Memphitic (or Lower Egyptian, less properly called "COPTIC"), belonging to cent. 4 or 5, contains them; as does the "THEBAIC" (or Upper Egyptian, less properly called the "SAHIDIC"), belonging to cent. 3. THE ARMENIAN (cent. 5), the ETHIOPIC (cent. 4-7), and the GEORGIAN (cent. 6) also bear witness to the genuineness of these verses. THE FATHERS. Whatever may be their value as to doctrine and interpretation yet, in determining actual word or their form, or sequence their evidence, even by an allusion, as to whether a verse or verses existed or not in their day, is more valuable than even manuscripts or Versions. There are nearly a hundred ecclesiastical writers older than the oldest of our Greek codices; while between A.D. 300 and A.D. 600 there are about two hundred more, and they all refer to these twelve verses. 1. PAPIAS (about A.D. 100) refers to v. 18 (as stated by Eusebius, Hist. Ecc. iii. 39). 2. JUSTIN MARTYR (A.D. 151) quotes v. 20 (Apol. I. c. 45). 3. IRENAEUS (A.D. 180) quotes and remarks on v. 19 (Adv. Hoer. lib. iii. c. x.). 4. HIPPOLYTUS (A.D. 190-227) quotes vv. 17-19 (Lagarde's ed., 1858, p. 74). 5. VINCENTIUS (A.D. 256) quoted two verses at the seventh Council of Carthage, held under CYPRIAN. 6. The ACTA PILATI (cent. 2) quotes vv. 15, 16, 17, 18 (Tischendorf's ed., 1852, pp. 243, 351). 7. The APOSTOLICAL CONSTITUTIONS (cent. 3 or 4) quotes vv. 16, 17, 18. 8. EUSEBIUS (A.D. 325) discusses these verses, as quoted by MARINUS from a lost part of his History. 9. APHRAARTES (A.D. 337), a Syrian bishop, quoted vv. 16-18 in his first Homily (Dr. Wright's ed., 1869, i. p. 21). 10. AMBROSE (A.D. 374-97), Archbishop of Milan, freely quotes vv. 15 (four times), 16, 17, 18 (three times), and v. 20 (once). 11. CHRYSOSTOM (A.D. 400) refers to v. 9; and states that vv. 19, 20 are "the end of the Gospel". 12. JEROME (b. 331, d. 420) includes these twelve verses in his Latin translation, besides quoting vv. 9 and 14 in his other writings. 13. AUGUSTINE (fl. A.D. 395-430) more than quotes them. He discusses them as being the work of the Evangelist MARK, and says that they were publicly read in the churches. 15. CYRIL OF ALEXANDRIA (A.D. 430) accepts the quotation. 16. VICTOR OF ANTIOCH (A.D. 425) confutes the opinion of Eusebius, by referring to very many MSS. which he had seen, and so had satisfied himself that the last twelve verses were recorded in them. John MacArthur also does not believe that 12 verses as found in Mark 16:9-20 are inspired Scripture and should be in our Bible. To see a very well done refutation of John MacArthur's arguments for their omission, see these Youtube videos done by James Snapp Jr. He completely demolishes MacArthur's position on these verses.